For some of us, one of the (main!) 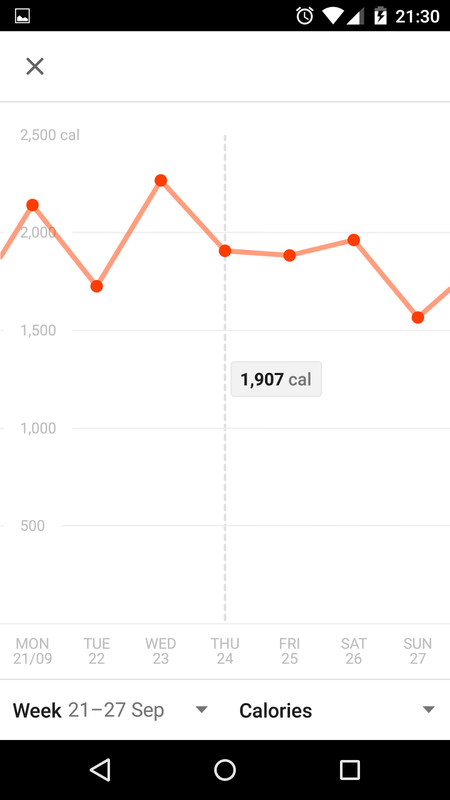 appeals of exercising is increasing numbers and statistics in our tracking app / software of choice. 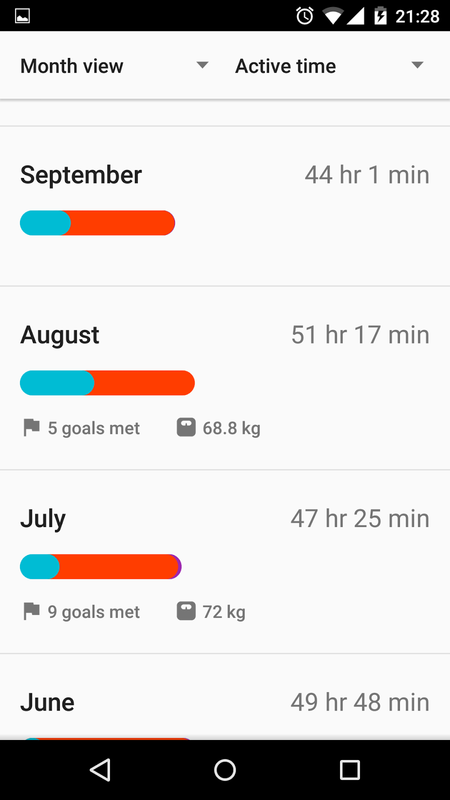 Google Fit was my first foray into exercise tracking, and remains my favourite 18 months later. Whilst it launched with very limited features, it has since grown to provide a wide array of features, and an even wider array of statistics. With an app on Android along with a web interface, the statistics are easily accessible from anywhere. This is the main purpose of Google Fit; to track your daily activity. It runs in the background the entire time your phone is on, recording steps, active time, distance, and (estimated) calories spent. The pedometer functionality is very reliable, always correctly counting steps taken. 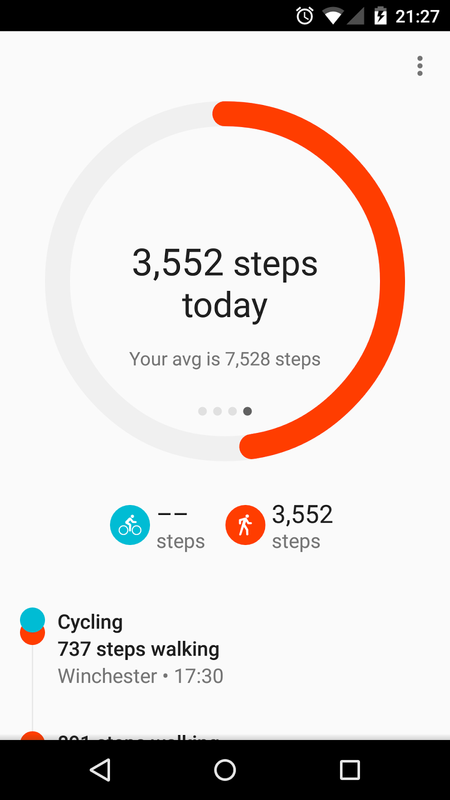 This step counter is also enabled during running, which is a statistic some running apps don't include. Similarly, the active time is very accurate, always reliably estimating the time spent cycling to and from work, and any walking periods. 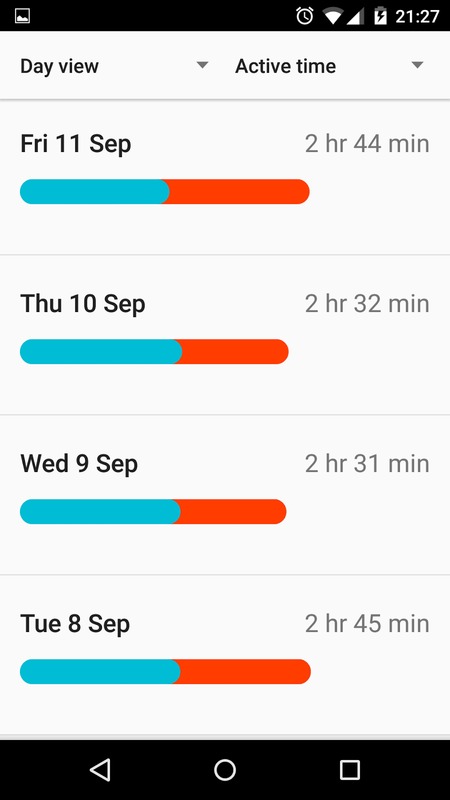 One potential issue the tendency of Google Fit to seemingly "desync". Essentially, the app will sometimes display clearly incorrect information for up to 24 hours after an activity is completed, before being replaced by the correct information at some point in the future. It can be fairly dissatisfying to complete a particularly gruelling run only to check Google Fit and see you've apparently run 0 metres. 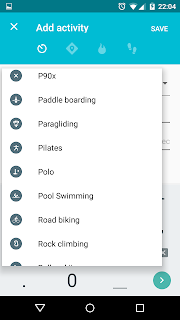 On a similar note, it's worth pointing out that the app isn't intended to be the perfect running / cycling / walking app, and instead aims to be the best at tying in all of these activities to provide a more complete view of your active life. Whilst it lacks any in-run notifications such as current distance or average speed, it makes up for this in the ease of tracking. 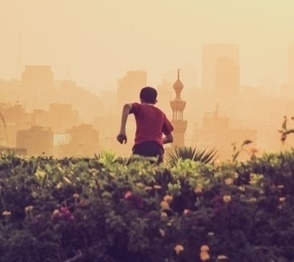 No longer will a run cease to exist purely because you forget to start up your running app of choice. As the distance function does not take into account your step length, and instead relies on GPS location, it is never perfect. However, I found it tracks my ~10 mile cycle rides reasonable accurately, and tracks my walking and running without fault. Perhaps the greatest flaw of the app is the misidentifying of activities. 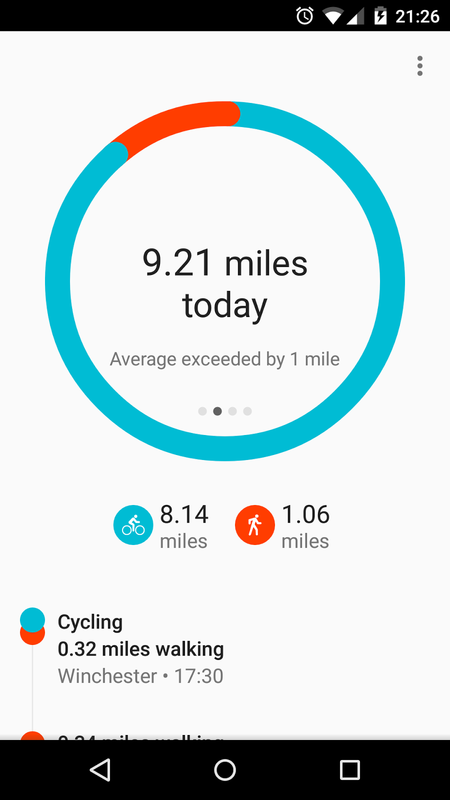 For example, half of my cycle journey may be erroneously identified as a car trip, and so will not display on Google Fit. As the metrics used to determine activity type are not publicly disclosed, it's hard to know what triggers this. Sometimes a cycle ride to a location will be tracked, and the return journey misidentified. Tying all of these together is the 4 screen circle interface, almost always visible in the app. This provides a central location to access all of the day's data, and has some beautiful animations to make viewing the information a pleasure. 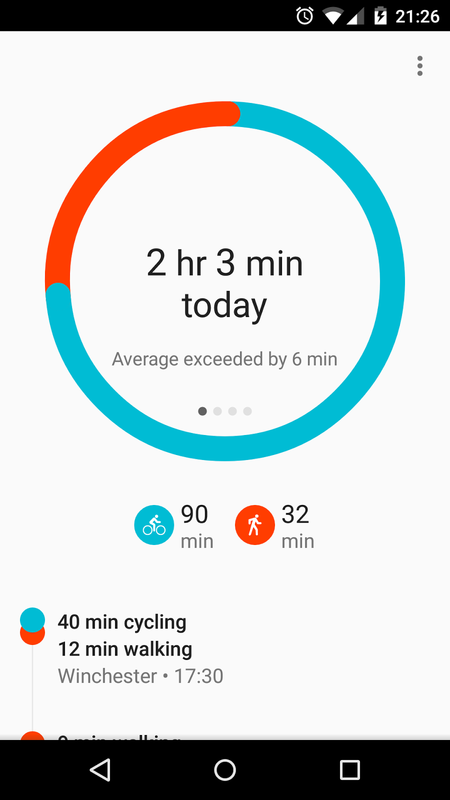 Coloured lines represent each activity type, with the entire circle representing your target (if set), or your daily average. All of these daily values are stored, and can be viewed through a massive variety of weekly and monthly views. These are excellent for tracking progress on any individual activity, or health as a whole, and can also include manually submitted weight measurements. 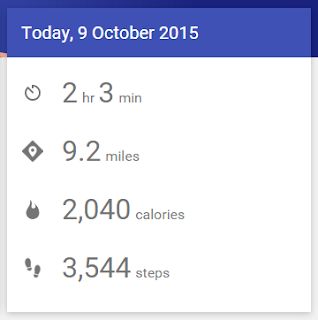 Luckily, any exercise sessions where Google Fit has failed to pick up on the activity can be added manually. 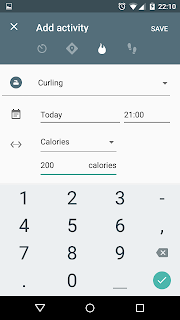 In the same area of the app, a massive list of other, less popular activities can be added, and assigned steps, durations, calories spent, and distance travelled. This relatively minor feature means that those who participate in a more niche sport (Curling, anyone?) means every possible active moment can be tracked if desired. As extra icing on the already very sweet cake, almost all of these 100+ activities have their own icon, or at least a very appropriate reused icon. Like any good Google app, there are plenty of settings that can be configured to make the app your own. First up is the favourite activities panel, where the activities most important to you can be tracked, and their colours modified. These colours determine the appearance of the main screen of the app, so the customisation possibilities are appreciated. Basic personal information (gender, height, weight) can be entered, allowing more accurate calorie / kilojoule estimations. Metric or imperial units can also be set granularly for height, weight, distance, and energy, perfect if you're in a country that tends to use a mix of both. 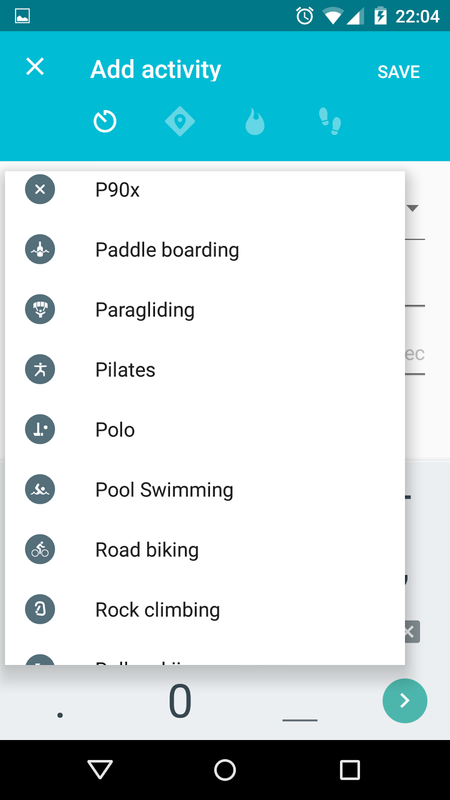 The remaining options fall squarely under the "miscellaneous" category, with the ability to turn off Google Fit tracking (huh? ), high accuracy mode (better stats, slightly increase battery drain), notifications (yet to actually receive any of these!) and in-app sounds. A goal can be set for any of the 4 tracked activity aspects, albeit for only one at a time infuriatingly. 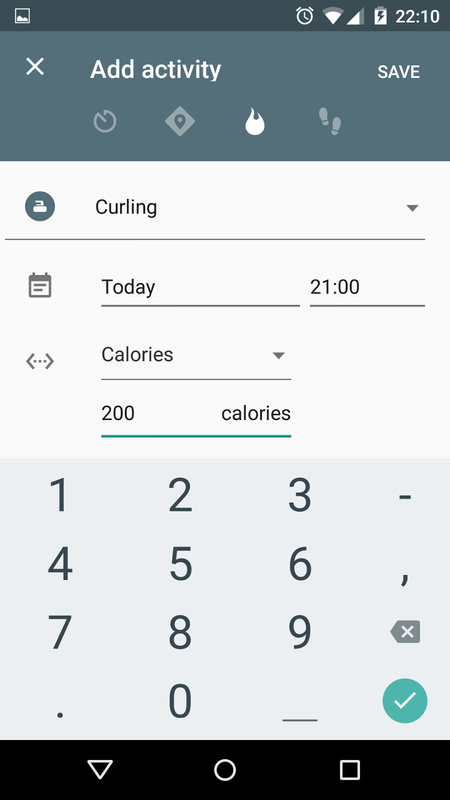 Not much is done with this goal, besides changing the capacity of the main app screen's circle, and replacing average values with goal values. Goals also makes a fleeting appearance in the monthly overview screens. 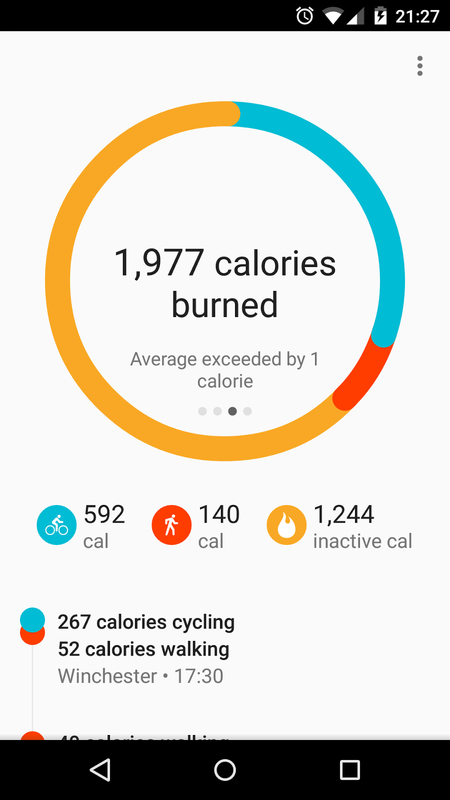 One of Google Fit's strengths is the ability to easily connect with the majority of fitness apps on the Android platform. 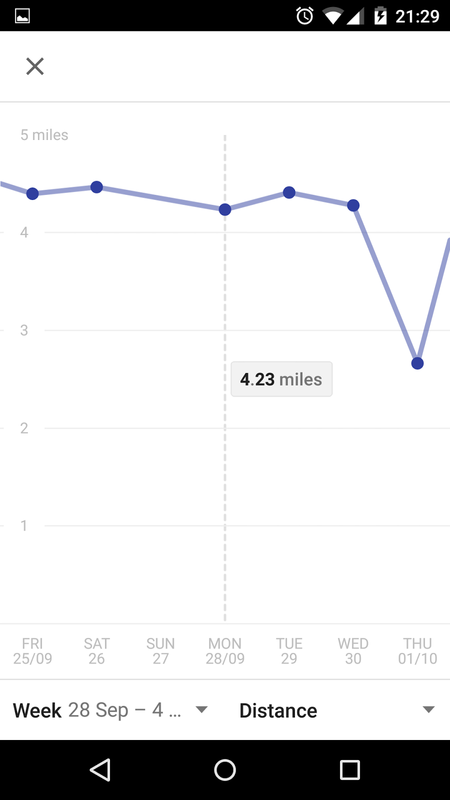 This means that you could use RunKeeper for precise run tracking, then have that data automatically exported to Google Fit for advanced tracking of progress over time. 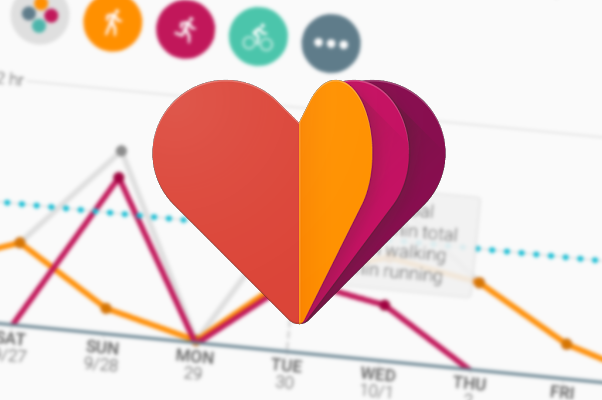 This API is also how information such as heart rate can be recorded and monitored.